Looking for a healthy, on-the-go breakfast with lots of flavor? 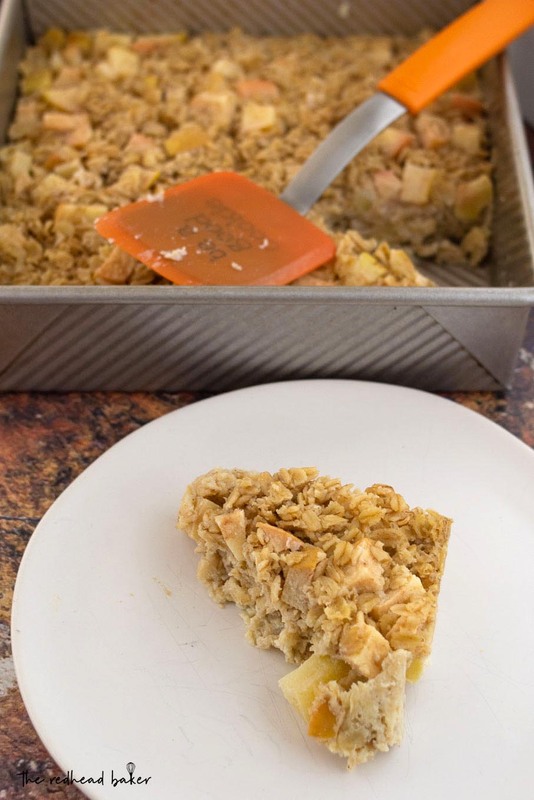 Try this chai baked apple oatmeal with warm spices and lots of sweet-tart apple chunks. It’s Day 6 of AppleWeek! Have you checked out the giveaway prizes and entered to win yet? If not, head over to Monday’s post to read about the prize packs from our generous sponsors and fill out the entry form. 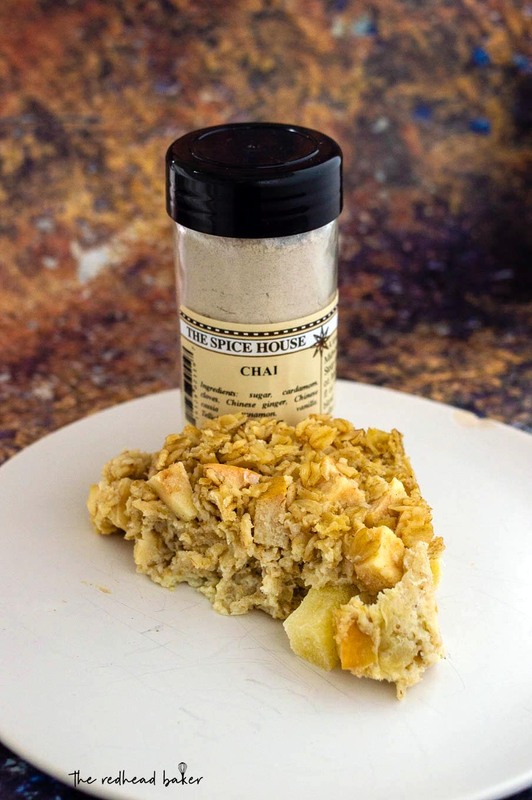 Today’s post is a delicious breakfast recipe made with chai spice mix from The Spice House. Everyone knows that cinnamon and apples go well together, but chai and apples pair well, too. Chai is a type of spiced Indian tea, and chai spice is a mixture of dried, ground spices that are typically found in that tea. The mix from The Spice House contains sugar, cardamom, cloves, ginger, China cinnamon, vanilla, and Tellicherry black pepper. You can add the chai spice mix to your tea or coffee, or add it to baked goods like cakes, cookies, pastries or frosting. The Spice House also sells a wide range of other herbs, spices and mixes. I also have their California pepper seasoning, which is fantastic on grilled steak. This recipe is very easy to make. Mix the dry ingredients in one bowl; the wet ingredients in another. Combine the two, and bake! This baked oatmeal is delicious at room temperature, but can also be served warm in a bowl with a bit of milk or half-and-half. 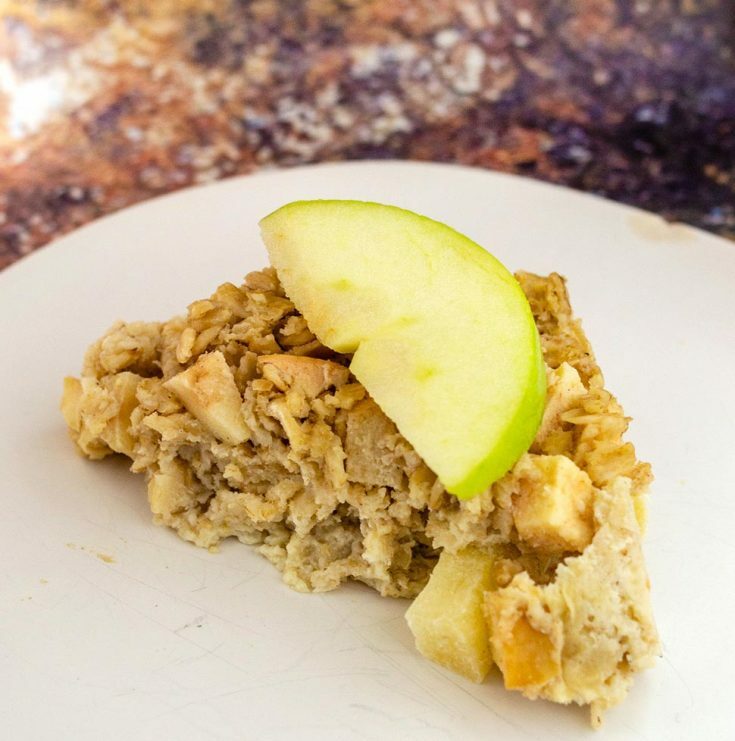 When you’re tired of the same old on-the-go breakfast, this baked apple oatmeal makes for a nice change of pace. And with 3 grams of fiber per serving, it will keep you feeling full all morning long! Preheat oven to 325 degrees. Grease a 9 by 9-inch or 2 quart casserole dish. In a medium mixing bowl whisk together oats, sugar, baking powder, salt, and chai spice. In a separate large mixing bowl whisk together eggs until well blended. Mix in milk, melted butter and vanilla. 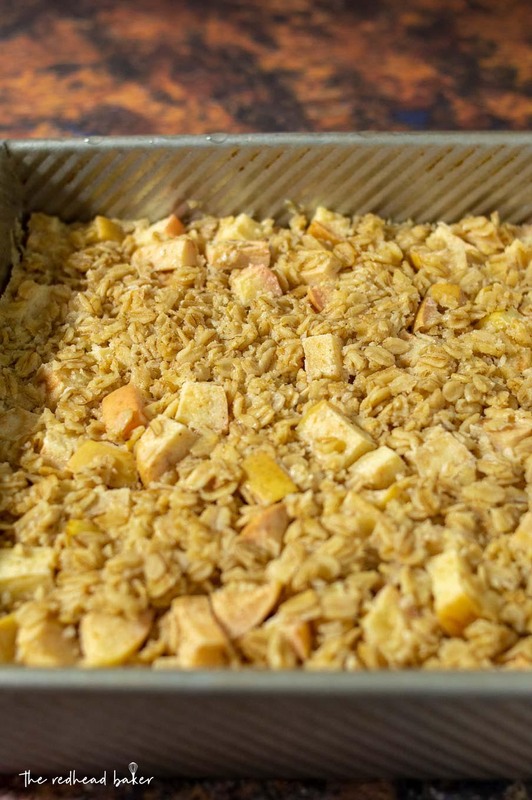 Add oat mixture to milk mixture along with diced apples and stir well. Pour mixture into prepared baking dish. 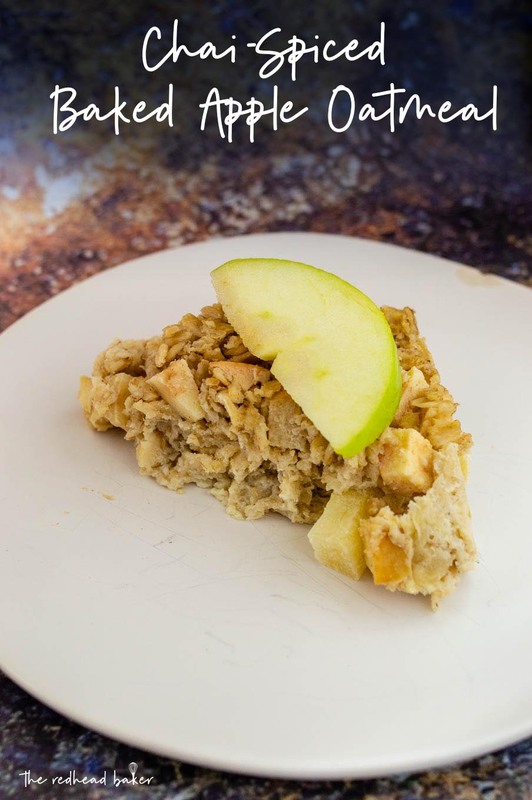 Bake for 45 minutes, or until the oatmeal is set and no longer jiggly in the middle. Cool until just warm on a wire rack, or cool completely and store, covered, in the refrigerator and reheat before serving. Perfect to serve up when I next have overnight guests.